Join our lively writing community and take advantage of generous class discounts. Learn more. Your donations fund important programs throughout the state. Learn more about how you can support our mission of helping writers find their voice. 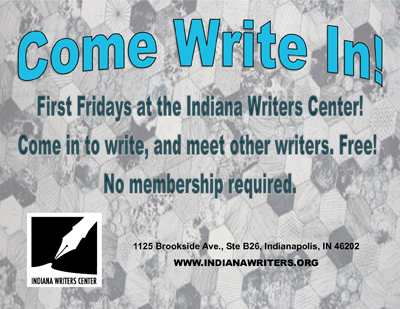 First Fridays at the Indiana Writers Center Come Write in! Come in to write, and meet other writers. Bring snacks to share if you want. Over sixty artists have galleries and exhibits open First Fridays at Circle City Industrial Complex. The Indianapolis Review is an online journal based in Indianapolis looking to publish fresh poetry and art. We have a focus on connecting and promoting the writers and artists of our region, but we also want to showcase poetry from all over the country and the world. We are interested in all aesthetics and voices, and only concerned with the art itself. We are assembling our current issue, and we would be happy to receive your submission! Please see the guidelines under “Submissions” in the Menu. Visit us at https://theindianapolisreview.com/. Cosmonauts Avenue is an online, monthly literary journal run by women and non-binary folks dedicated to elevating and amplifying underrepresented voices. We publish fiction, poetry, nonfiction, interviews, and more, from writers around the world, in English and in translation. Submissions are free and always will be. This is one way we hope to remain accessible to all writers, whether new or emerging or established. We are committed to providing a platform for folks who are marginalized in the literary community, including but not limited to people of color, ciswomen, trans men and women, nonbinary people, members of the LGBQA community, and people with disabilities. We want to elevate underrepresented voices and include a wide range of identities and experiences. We want work that pays careful attention to craft while remaining urgent and surprising. As Beyoncé might say, we want your most flawless work. We can’t wait to read it. We believe in you. Poor Joker Press is a Chicago-based indie publisher focusing on meaningful, well-crafted, short-form writing. All titles from Poor Joker Press are printed in a 3.5 x 5-inch format, allowing readers to carry our stories with them -- in pockets, on city trains, in purses and on the move. BRANCHES invites submission of essays, artwork, poetry, and photographs. Submissions must be written or created by Hoosiers or feature topics directly related to life in Indiana. Send essays, artwork, and/or calendar items to the editor. Branches has rolling monthly deadlines. Join the #WritersHack Meet Up Group. The biggest impediment to writing: making time. Need motivation? The Writers Hack (#WritersHack) is a group of Indianapolis writers who gather in local coffee shops and eateries for short bursts of awesomeness. Our gatherings are sometimes as small as two people and sometimes as large as ten. We usually do some quick introductions, and then start writing. We keep talking to a minimum until there’s about 10 or 15 minutes left. Then all bets are off. Here’s what is important for you to know: There are no requirements for attending. We aren’t just looking for professionals (although some of us are). We aren’t looking for people who can help us get published (although some of us might). This is just a group of people who want to carve out time to write without justifying why. This is a group of people who want to commune with other writers over words, coffee, beer, or food. Static submission guidelines can always be found here, as well as on our current calls for submissions page. Thanks for considering us as a home for your work! Students grades 3-12 are invited to join us to strengthen and explore their writing skills during an afternoon of fun and adventure. We are pleased to offer the Butler Bridge Program to students in grades 3–12. The program draws on Butler's remarkable resources to build a bridge between Butler and its community, as well as between students who aspire to higher education and the professors, professional writers, teachers, and college mentors who are eager to share what they know. Our Vision: Butler Bridge programs combine learning, laughter, and compassion to inspire young writers and readers. The programs connect bright, young people with talented mentors and like-minded peers to nurture intellectual and artistic discovery. This learning-rich community rejects a narrow version of education, in which, too often, assessment structures learning. We reach for a goal that is harder to define: enhancing creativity, developing the imagination, finding our own voices. We help our students and campers be so engaged with the joys of the literary arts that they don’t even notice how much they are learning. For accessibility information or to request disability-related accommodations, please visit www.butler.edu/event-accommodations/. Creating a new female narrative one story at a time. Every form of personal expression has a home at speakyourstory.org. SpeakYourStory passionately believes in a future where all women, from all walks of life, are empowered to say, “I exist and my stories matter.” Our story sharing platform is designed to be inclusive, compassionate and safe. We will not edit your stories and we publish everything that we receive. We honor every woman’s unique voice and encourage all forms of self-expression. Your story may be a song, a poem, an audio recording, video, a painting, written words, or a photograph. Literally, anything that speaks to your true self has a home here. Please share your pictures, paintings, poems, videos and writing HERE. Hip Mama magazine is looking for unique, creative, strong, edgy, alternative parenting stories for upcoming issues. Check out the magazine here. Poets & Writers: New Writing Contest Deadlines!